Living as a cancer survivor is as difficult to get used to as living with a cancer diagnosis. There aren’t as many tears but there are lots of uncertainties. There aren’t as many urgent decisions but there is lots of guilt that every decision is urgent. When I got the all clear from my doc, I celebrated. I have been living my life in three-month intervals. As a survivor, I never want to take my stance for granted. I feel vindicated when I set out to run a marathon, write a book or organize an eternally junky pantry. I like measurable results. Producing something, anything helps me to feel like I’m not wasting these days God has gifted me. The reality is my days offer little opportunity to run or to write or to organize. The minutes tick by as I kiss a child’s boo boo, soothe away hurt feelings and fold endless loads of laundry. Always laundry. While I can’t measure the effects of kissing boo boos, mending hearts or keeping a household running daily, I’ve already lived long enough to know these things matter. Lots. If anyone should be able to see and live what matters most, it’s a cancer survivor. Don’t ya think? That’s the question that gnaws at my heart. That’s the question that gnawed at my heart this time last year. Before I was diagnosed with cancer. Before I became a “survivor.” I “knew” then what matters in life. I mean, I thought I knew. I've come to know that sometimes life produces moments that can't be measured. They're simply too big. Even the ordinary seemingly mundane moments in my mind can be monumental to the child's whose boo boo is being kissed. I tried to live like this last year and all the years before that. This past year has made me realize that ordinary is priceless. I've tried to line my priorities with my heart, my beliefs and my convictions. It’s hard to line things up in a neat little row. And so I sit here tonight wondering if somehow over the last three months my row has gotten a little crooked. And then I walk over to my eternally junky pantry to search for the Saltines and glance at the overflowing laundry basket and sit back down to eat a snack with my kids. Because they matter most and I know they are only little for a bit. And I never want to take a second for granted. I am so thankful for the immeasurable moments. I don't take God for granted. and I'm watching my step. This verse is a treasured prayer in our home. Commissions pay our bills, buy our food and pad our bank account. Without them, we starve. We need Jesus to meet our needs. My husband knows that the ability to sell is a gift. My husband knows clients ultimately come from God’s favor. My husband prays this prayer every day. I’ve started to follow his example but even as I pray the prayer we’ve prayed daily for years, it is changing. I need so much more than physical sustenance to make it through each day. Part of my communion experience is to commit every part of my day to Him and to recognize my predisposition to fail without His strength. I need patience, kindness, tenderness, gentleness and energy to make each day successful. One of the largest frustrations I have as a mother is the constant re-doing of what’s already been done. Mopping the same floors, wiping the same counters, washing the same clothes, cleaning the same bathrooms not only day after day but some days hour after hour. It’s like I’m the grown-up version of my kids’ argument against making their beds: I’m just getting back in it tonight. Isn’t that beautiful? As moms we get to be the servant Jesus was to His disciples. We get the honor of committing them to the Lord and we do that by committing ourselves to the Lord. Every. Single. Day. This is why I started making my personal communion a priority instead of a sometimes-when-I-think-about-it experience. I need daily bread, The Bread of Life, sustenance of heart and soul to lead my children courageously and to serve my children humbly. Today is a very special day. In honor of you, some very special people, my first vlog. Join our celebration! I love you my bloggy friends and family! With birthday love and 40 hugs! PS Special thanks to Andrew's ability to get turn this video into a vlog!!! Sorry for the uncenteredness of this vlog and sorry that me talking is not half as exciting as a 5th Smith baby would be (see previous post's comments). Smiles to you all tonight! Stay tuned for a special video edition of today's Glad Chatter. The thing about vlogs is they take forever to upload and I have no idea what I'm doing. Hopefully Andrew can save the day, tonight. Because you won't wanna miss this exciting message straight from my kitchen table to your screens!! I sit at my kitchen table. Dora the Explorer sings in the background. My mind races aware of the clock ticking away the seconds of my day, counting the minutes until my preschooler needs me. Frustration hovers as my derailed morning struggles to settle back on its tracks. I silence my mental ticking, ignore Dora and wait on the Spirit of God to settle over me, over my morning. I wait for His holy to settle on my ordinary. As He comes near, I take in the elements of communion. I taste the bread, sip the wine, thank the Lord. I commit this day to Him, the parts filled with Dora, the parts filled with peanut butter and jelly messes and oatmeal kisses. I lift the parts where I wonder if what I’m doing really matters and the parts where I see glimpses of a larger picture. Suddenly my average day becomes an opportunity for more. Sitting in my little kitchen my heart welcomes big possibility. I start the morning by taking communion because a friend of mine shared her experience with me shortly after my surgery. The communion experience is a beautiful picture of the intimacy of what Christ did on the cross. I love how it feels to take the ceremony out of it and personalize it at my kitchen table, or in my study or on my porch wherever I happen to be waiting on God that day. Taking the elements signifying Jesus’ body into my own invites Him to a close place with me each day. It invites His holiness to invade my ordinariness. Read what I wrote about it last year here. Take a moment with me today and invite Jesus to an intimate place in your own life wherever you are. Invite the holy to invade the ordinary and welcome the possibilities. It was something that needed to be done. A celebration of its own sort, an excursion of its own category, an undercover event of epic (or not so epic proportion) some might say. Last week I went post-cancer-removing-surgery-breast equipment shopping. The last time I enjoyed this type of shopping, I was a perky twenty-something eager for marriage and spending vast amounts of gift cards at that secret fancy pajama shop in the mall. Then I got married, got pregnant, had babies, nursed babies, gained weight, lost weight and somewhere in the middle of babies and weight gain I learned that driving down a grocery aisle and throwing lingerie in the cart faster than a toddler can throw it right back out is an art form. I’m serious, y’all, because if a toddler throws it right back out but you’re already talking to a salesman in electronics about where the batteries for the camcorder are located, you’ve been seriously embarrassed! I’m not too picky about such garments because there’s not that big of a job to do. You know what I mean? It’s okay guys, even the first surgeon I met with kindly let me know there wasn’t much there… but he could fix that. But since I opted to not get rid of what little I had, I have had this day in the back of mind for many months. But just because you know something’s coming and just because you’re thankful it is coming and you’re going to the local JC Penney and not to the hospital’s “Appearances” department, doesn’t mean you look forward to it or are excited about it. Because I wasn’t, excited that is. I was and still am thankful, very. Anyway, the post-surgery me has worn a sports bra every day. Actually, the post-cancer diagnosis me has worn a sports bra every day. As a matter of fact, it wasn't until my radiation oncologist forced me to remove the sports bra for a few hours each day that I even felt like taking it off. Ever. Then and there I decided this type shopping would have to be scheduled into my calendar and worked around a schedule full of others. So last week, I had me a day. I drove to the fancy local JCPenney where they have these plush and purple-y ladies only dressing rooms. And lo and behold they were having a Veterans’ Day sale. I saw bright lights and heard loud music as I slyly grabbed a few items off the rack and ducked into the fancy little room. I left a doubly happy and doubly blessed lady because comfort and practicality at a price that can’t be beat makes a girl all happy. So as I stood in a long line and handed said items to a man behind the counter (who has never seen this blog), I secretly celebrated this personal event that every one of your prayers made possible. the kingdom all yours! You've raised yourself high over all. The thing about silence is that it makes words form inside your head. I like that feeling. Lots. I remember a few years ago when our pastor preached a series on disciplines of the christian life. He spent a long time on silence. Living a life devoid of solitude leaves little room for God because it's in the spaces He speaks. I decided that Sunday morning I would intentionally sow solitude into my life lengthening the spaces between and inviting God to speak. The silences are good because I am reminded of the sound of God's voice, the treasure of being called and I can once again see the bridges over the canyons in my life. This particular period has been lengthy here in bloggyland but the good news is I have things rattling around to share with you and I am yearning to feel the keys beneath my fingertips once again. Thanks for your understanding. I have pictures, pictures, pictures to share because our family has been so busy. Our Halloween was filled with friends and freedom and we just had an early Thanksgiving gathering this weekend. I celebrated another "first" wearing the hat of cancer survivor. My sweet husband just gave me an early birthday present with you in mind. And I can't wait to share all of it here. 26as our winner. Congratulations Big Fat Mama!!! I'll be in touch via email to send you your gift certificate for your own copy. the God of Israel, who calls you by your name. What's in the Bible Giveaway!!! A few months ago, my nine-year-old daughter asked me how come God wanted us to read the Bible since it is so hard to understand. My mother's heart broke because I totally understand her. We had a quick theology 101 class where I explained to her how the Holy Spirit lives in her and will give her knowledge and wisdom to understand God's Word if she would ask for it. Then I explained to her my own experience with reading God's Word. It took me lots of years of "practice" until I finally felt God's voice while reading the Bible. Which led to even more theology as we discussed how we can "feel" a voice. 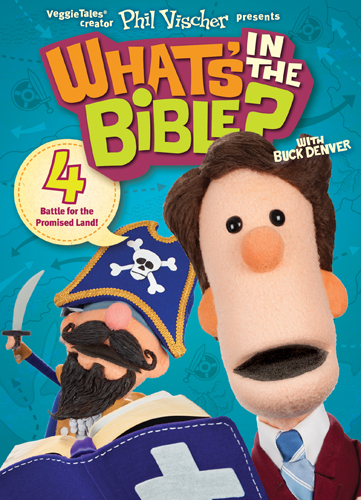 Anyway, our family was excited to receive a copy of Phil Vischer's What's in the Bible 4: Battle for the Promised Land. As we are not great Veggie Tales fans I didn't quite know what to expect from this series. This is a great choice for a family movie night where the whole family can learn something. My three younger children watched the movie. Alyssa (9) and Hunter (7) fell asleep and had to watch it over a couple of sittings but my Palmer(4) loved it! He's been singing the catchy songs and keeping us all in stitches. I loved knowing my children were learning something worthwhile as they sat in front of the television. There was something for every member of the family to learn from basic Bible facts, characters and truths to historical facts that even Bible scholars will find refreshing. Both Alyssa and Hunter said they learned from the movie. Hunter said the stories made confusing facts in the Bible easier to understand. They both found it entertaining. Alyssa said it was funny and Hunter said he loved the songs. Alyssa said she would enjoy the rest of the series but Hunter said he wouldn't want to watch them. Alyssa couldn't pick a favorite character but Hunter thought Buck Denver was pretty cool. For more information go here and here. Leave a comment here through this weekend to win a free copy for your family. I'm not exactly on speaking terms with my blog these days. Some where, some how, some way the blog called Glad Chatter starts giving me the silent treatment. Whenever I visit words elude us. I thought it best to give her a little room and let the stress fade away and all. I've always been a fan of healthy boundaries so it seems like a logical choice. I look forward to the week of fall break we have over the Thanksgiving holiday. One whole week of summer-like routines minus the heat. Okay, God, please give us heat or at least the sun. My children don't do well cooped up for a whole week and heavens, what would that do their mama? Maybe the world will slow down enough by then so I can spend some quality time talking to my blog. But until then just expect surprise here at Glad Chatter. Pictures, words, silence, gifts who says variety is boring? Tomorrow I'll be hosting a really fun give away. So don't give up on me because you might miss a free gift. And gifts, everybody loves gifts. Right?